Interested in taking an underwater photography class with us in Bali, Indonesia? Interested in one of our exciting group travel trips in the near future? 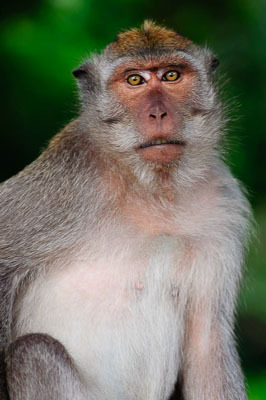 Or interested in creating a fantastic custom scuba diving safari tour in Bali? You have come to the right place, simply fill in the contact form below to send us an email and we will get back to you as soon as possible. We also create the Underwater Tribe newsletter that we send out approximately every three months, if you are interested in receiving it, please sign up on the form at the bottom of the page. Are you a social media fan? Please click on the Facebook and Twitter symbols on the right hand side of the page to connect with us online! We promise it won’t be a monkey replying to the email! One of my all time favourite photos is this photo of a black and white banded sea snake (krait) surfacing for breath. The photo was taken at the island of Bunaken on one of the famous Likuan dive sites which feature a shallow reef bordered by a sharp vertical wall. It was during the morning on a dive to this site where I encountered this beautiful sea snake while doing my safety stop in the shallows. I patiently followed the snake for a while taking a photo or two of it while it stuck it’s head into a few holes in the corals, possibly looking for a meal. The snake was not bothered by my presence and continued to swim along the reef in no particular hurry. However, as any air breathing animal is want to do, it eventually had to swim toward the surface for a breath of air. This is when I knew the best photo opportunity would take place, as the snake would have to swim up toward the flat calm surface. Sure enough, off the snake went toward the surface and I quickly followed it while taking a few shots of it from below. Immediately, I knew the photos would be winners as I could see the beautiful blue/green water pop up on my screen afterwards. 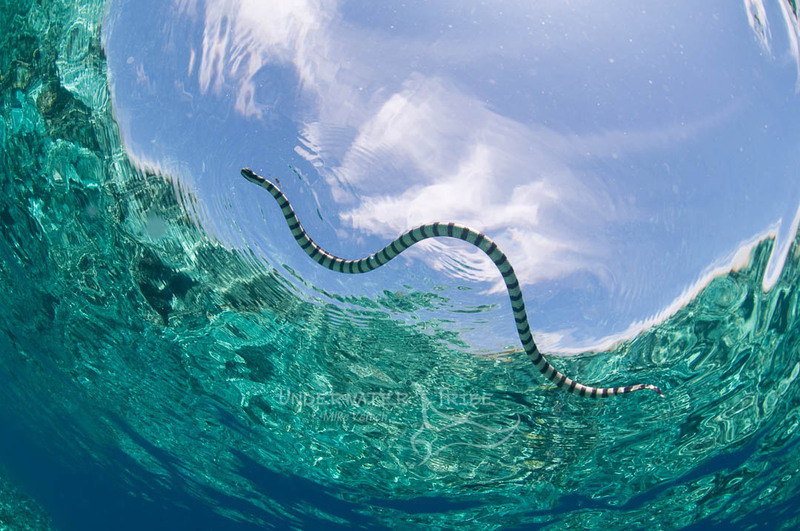 There are two elements of this photo that I believe really make the photo: firstly, the green reflection of the reef surrounding the white clouds and blue coloured snell’s window and secondly, the ripples that the snake’s head makes on the water as it surfaced for air.